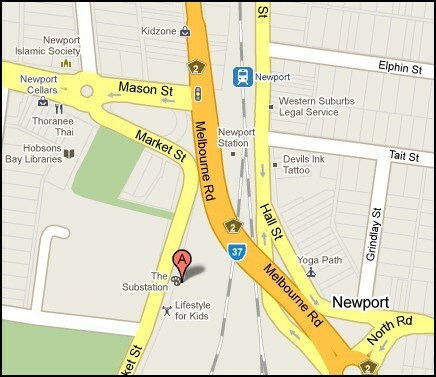 The Substation is located at 1 Market St, Newport, which is approximately 1 minute casual stroll from Newport Train Station, as you can see on the map below. The last train from the city to Newport leaves Flinders St Station at 1.08am, arriving at Newport at 1.25am. For returns into Melbourne, the last train is just before midnight, which will probably be a little early for most of our patrons! After this time, Nightrider buses depart from 2:09 am and then every 30 minutes til 4.09am from Mason St/Newport Rd just opposite the Station as can be seen above(also see Metlink map here) so returning into the city is easy! There is ample free parking adjacent to the venue for those arriving by automobile. We can assist at the front desk with organising joint taxis, please ask about this service when you arrive at the venue. The two hotels in the immediate vicinity of The Substation (The Junction and The Seagull's Nest) do not offer short term rooms. If you're looking for the nearest accommodation, you might try the Williamstown Road Junction guesthouse, 481 Melbourne Road Newport (0403 802 728). If you're looking for an atmospheric and affordable hotel in the city (and don't mind a few rough edges) you might consider The Victoria Hotel, 215 Little Collins Street Melbourne (1800 331 147).